Bright-Eyes & Bushy-Tales: Welcome to my blog! So, I've been thinking of starting a blog for a long time, and I've finally decided to take the plunge. My plan is to focus my posts on all things happy & healthy, from nutrition, to fitness, to little stories about my life in general sometimes. If you know me, you know how much I love & need my breakfast. I am not the type of person who can just walk out the door and stop at Starbuck's for a Latte and call it a morning. I need FOOD, preferably within an hour from when I wake up. Whether I ate salmon & broccoli for dinner at 6PM after a hard workout like a "good girl," or splurged on some PIZZA (ahhh, pizza, mmm), I wake up absolutely starving! Let me just say: me = starving = not a good thing. I am generally a very happy, upbeat person, but when I am overly hungry... I am just. plain. grumpy. So how do I fuel up for a big day out in the city? I have been mixing oatmeal, with a spoonful (small spoon, let's not get crazy here!) 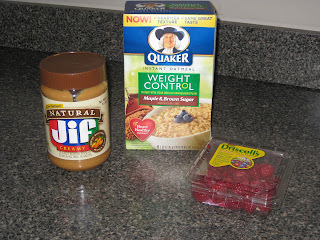 of Jif Natural peanut butter, and a small handful of raspberries. 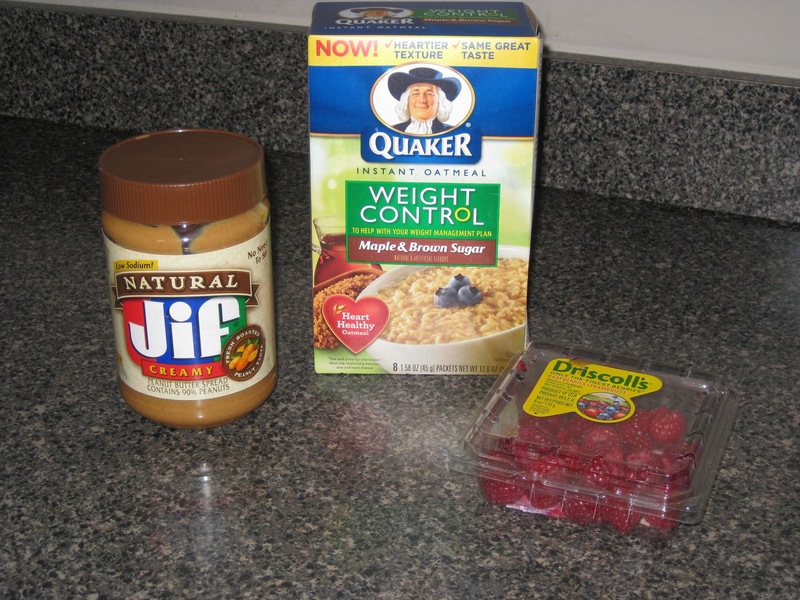 I pop 1 packet of oatmeal + 1/3 cup water +1/3 cup organic fat free milk into the microwave, stir in the peanut butter, drop the raspberries on top, and TA DA -- a filling, protein & fiber packed breakfast! Why do I enjoy this meal? I will not sit here and tell you how many calories this breakfast has in it. I have all but given up on calorie counting. I just don't believe in it anymore. I have learned over the years what works best for me, and counting calories just isn't it. It just makes me kinda crazy about food and my lifestyle doesn't really allow for it. So, what is great about this breakfast? 1) It has protein! I would estimate about 10.5ish grams of protein, depending on how crazy you get with the peanut butter. 2) It is surprisingly low in sugar! The Jif Natural has only 3 grams of sugar per serving (2 tablespoons), and the oatmeal has only 1 gram of sugar per packet! Those are some very low numbers for peanut butter & oatmeal! I will tell you that this oatmeal can be difficult to find. I got hooked on it over the summer, and then they took it away from me at my grocery stores! As Stephanie Tanner would say, HOW RUDE! But, don't despair (wow, did you know that was spelled with an "e"? ), I have now found it at both Target & through PeaPod (we will talk about the Pod at some later date!). 3) The raspberries sweeten it up a little, add some more substance, and are full of antioxidants (whatever those are!). Sometimes I will top this little number off with an extra splash of organic milk! Bright-eyed, bushy-tailed, and ready to take on the world!!! Well, at least Chicago! I also enjoy myself a skinny vanilla latte on some days when I'm really feeling like doing it up, or as the peppy Starbuck's lady near my work likes to call it, a "skivizzle!" 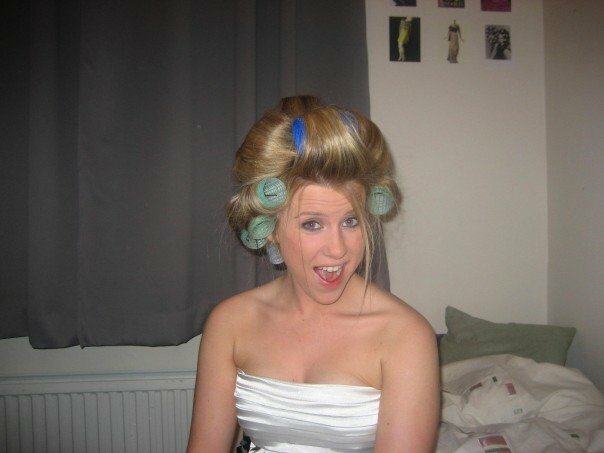 AHHHH I AM ALREADY OBSESSED WITH THIS BLOG JESS!!! Great idea :) If you need any "featured" amateur chef/foodie writers, you know where to go!! !